Are you planning to visit the romantic Paris and you are looking for Paris accommodation? Enjoy one of the most fascinating cities in the world and book one of our hotels. We offer the possibility to choose among: 1 to 5 star luxury hotels, first class inns, bed and breakfasts and apartments. All Paris hotels presentations include in depth descriptions and detailed images to let you choose the best solution for your stay. Do not hesitate, book now in a few clicks. The French Capital offers many attractions: the Tour Eiffel, which became the symbol of the city, the Cathedral of Notre Dame, the marvellous parks, the numerous museums, its vivid neighbourhoods and its throbbing nightlife. Let be enchanted by its charm, the elegance of its shops and its cafeterias. 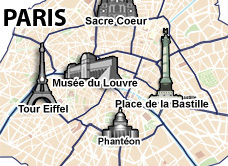 Reserving one of our hotels in Paris is easy. You can cancel your reservation without paying any penalty according to the cancellation policy fixed by each hotel. Book the solution that best fits to your needs by clicking on the map and choosing the hotels divided in different city zones. Discover our featured hotel deals and grant yourself a great value for money stay in Paris.